DEP Southeast District Director Jennifer Smith and representatives from the Village of Wellington Water Reclamation Facility. 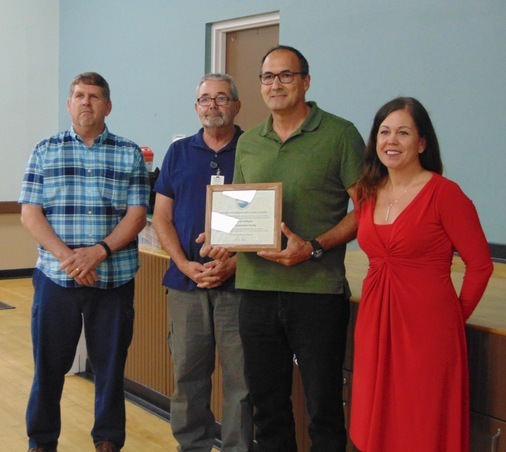 POMPANO BEACH, Fla. – The Florida Department of Environmental Protection recognized the Village of Wellington Water Reclamation Facility as the recipient of the 2017 Plant Operations Excellence Award. The Village of Wellington Water Reclamation Facility also earned the Plant Operations Excellence Award in 2004, 2005, 2006 and 2015. The Village of Wellington Water Reclamation Facility has implemented the latest technology to automate many of their systems, as well as procedures to ensure the consistency and efficiency of their operations. In addition, the facility recently completed an expansion project increasing the plant’s capacity to 6.5 million gallons per day, as well as increasing the capacity of their reuse system. Each year, the department presents awards to domestic wastewater and drinking water facilities around the state that demonstrate excellence in operation, maintenance, innovative treatment, waste reduction, pollution prevention, recycling or other achievements. These awards recognize facilities that demonstrate a special commitment to excellence in management through dedicated professionalism and that have an impeccable history of record-keeping compliance. The department is awarding a total of 14 facilities, including six domestic wastewater facilities and eight drinking water facilities statewide. The other awards will be presented at district ceremonies during the Focus on Change Seminars in Punta Gorda, Ocala, Haines City, Lake City and Panama City. This is the 28th year that the Florida Rural Water Association has conducted the Focus on Change Seminar in conjunction with DEP. The seminar is designed to provide current regulatory information to utilities in order to improve compliance. The Florida Department of Environmental Protection is the state’s principal environmental agency, created to protect, conserve and manage Florida’s environment and natural resources. The department enforces federal and state environmental laws, protects Florida’s air and water quality, cleans up pollution, regulates solid waste management, promotes pollution prevention and acquires environmentally sensitive lands for preservation. The agency also maintains a statewide system of parks, trails and aquatic preserves. Visit the department’s website at https://floridadep.gov/.